I was joined by Karin Ridgers of Vegfest on my radio show at the start of February and she explained all the benefits of a vegan diet and how it can help prolong your life. It hasn’t all been easy – I struggled to find vegan alternatives for ingredients such as butter, milk and cheese. So I was really pleased that this week’s book, Eat Well Every Day by Alice Liveing, includes a handy Simple Swaps guide. My vegan challenge is finishing in a couple of days so the dishes I have chosen are venison steak and creamy puy lentils . Happy cooking! In a bowl, mix together the olive oil, ginger, garlic, soy sauce and pomegranate molasses. Add the venison steaks, turn to coat and set aside to marinate for about 15 minutes. Put half the coconut oil into a roasting tray and place in the oven to melt. Once melted, remove the tray from the oven, tip in the parsnips along with the miso paste and toss to coat. Season with pepper (it doesn’t need much salt, as miso is already quite salty – you can always add some once cooked if needed) and cook in the hot oven for about 40 minutes, tossing halfway through. Meanwhile, heat the remaining tablespoon of coconut oil in a frying pan over a medium-high heat until melted. Add the venison steaks and cook for around 3-4 minutes on each side for medium-rare, or longer depending on their thickness and how you like them cooked. Remove the steaks to a chopping board to rest for a few minutes. Return to the pan to a high heat. Pour in the leftover marinade and leave it to bubble until thickened. Slice and serve the steak with parsnips and spinach, then drizzle with the reduced marinade. Heat ½ tbsp of coconut oil in a frying pan over a medium-high heat until melted and fry the bacon for 5-7 minutes or until crisp and cooked through, turning halfway through. Remove from the pan and pat with kitchen paper to remove any excess fat. Return the pan to the heat, add the remaining coconut oil and fry the red onion for around 5-7 minutes, until softened, stirring occasionally. Next, add half the bacon, all the lentils and pour in enough boiling water to cover the lentils completely. Bring to the boil, cover, reduce the heat to medium-low and simmer for 20 minutes. Remove the lid, add the peas, remaining bacon, balsamic vinegar and tomatoes and season well with salt and pepper. By this point the majority of the water should have been absorbed. Cook for a further 5 minutes over a medium heat. Finally, remove from the heat and set aside to cool for a few minutes. 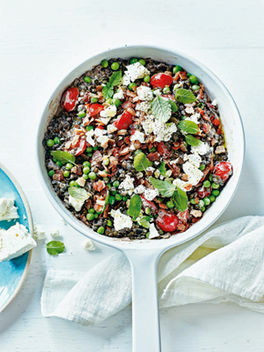 Season then stir through the Greek yoghurt and top with the crumbled feta and fresh mint.